The White House has defended the use of images from the 11 September 2001 terror attacks in adverts for President Bush's re-election campaign. Some victims' relatives have complained that the images exploit those killed in the attacks and are in poor taste. But Bush campaign adviser Karen Hughes said the adverts were "very tasteful". "It's a reminder of our shared experience as a nation... not just some distant tragedy from the past. It really defined our future," she said. The four television advertisements, which began showing on Thursday across the US, marked the beginning of the Bush administration's campaign for the 2004 presidential elections. 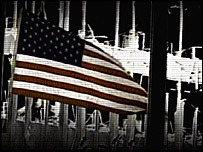 Among the images shown in two of the advertisements are images of firefighters carrying a body, draped in a US flag, from the rubble at Ground Zero, where the World Trade Center once stood. White House spokesman Scott McClellan said 11 September was "a defining moment" for the United States. "It was an experience that all Americans shared. It is the reason we are still at war on terrorism," he added. BBC Washington correspondent Rob Watson says President Bush is campaigning on the basic pitch that you don't change leaders during a time of war. But this controversy shows it is a pitch that will have to be handled with sensitivity if it is not to backfire, our correspondent says. The International Association of Fire Fighters condemned the decision to use their images and said the US president was being hypocritical. "We're not going to stand for him to put his arm around one of our members on top of a pile of rubble at Ground Zero during a tragedy and then stand by and watch him cut money for first responders [emergency services]," he said. Dawn Peterson, whose brother died in the attack on the World Trade Center, described the ads as "totally disgusting". Other relatives said they felt their loved ones were being used to score political points. "Families are enraged," victims' advocate Bill Doyle, who lost his 25-year-old son in the attacks, told Reuters news agency. "What I think is distasteful is that the president is trying to use 9/11 as a springboard for his re-election." "It's entirely wrong. He's had 3,500 deaths on his watch, including Iraq." Democrats have called for the advertisements to be withdrawn, while the campaign of the party's presidential campaigner called them "multimillion-dollar revisionist history". "What he doesn't tell you is that only 10% of fire departments across the nation have personnel and equipment to respond to a building collapse," said Stephanie Cutter, spokeswoman for the Senator John Kerry campaign. "Just four seconds of images of 9/11 have prompted cries of exploitation"